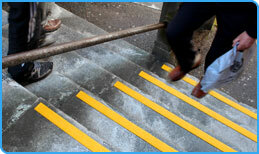 Designed for use with your existing stairs, quick and cost effective solutions to improving safety. 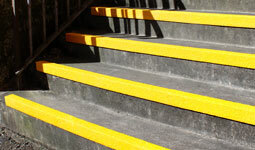 Improve safety with GRP Stair Nosing. 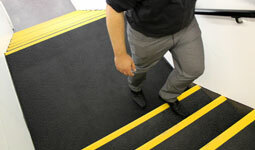 Quick and easy to install Safe Tread anti-slip Stair Nosing offers a cost effective, long term solution to help comply with the Disability Discrimination Act (yellow and white nosing). In Medium and Fine grit and a range of colours including a glow-in-the-dark option. Designed to cover your existing stairs, anti-slip GRP Stair Treads are a quick and cost effective solution to improving safety. 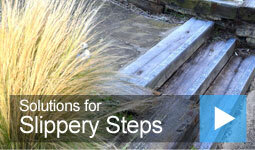 Ideal for stairs with high footfall and heavily worn steps. Available in a range of colours and finishes, our stair treads will help you achieve DDA compliance (black or dark grey treads with yellow or white nosing). 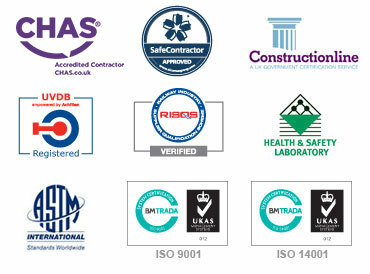 Made from tough, hardwearing, durable GRP, they are guaranteed for 10 years. For stairs deeper than 350mm, or landing areas. 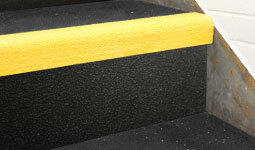 GRP Stair Tread Covers with extra depth for deep steps or stair landing areas. A quick and cost effective solution to improving safety. Available in a range of colours and finishes, our extra deep stair treads will help you achieve DDA compliance (black or dark grey treads with yellow or white nosing). Made from tough, hardwearing, durable GRP, they are guaranteed for 10 years. Safe Tread Riser Plates clad the front of your step surface, offering a visually improved appearance and completing the look of your stairs. Riser Plates conceal existing worn or untidy step surfaces and prevent objects falling through the open area of steel or timber stair-cases. In a range of colours and finishes. Made from tough, hardwearing, durable GRP, they are guaranteed for 10 years. Fit to the top of your step surface, with a gritted surface giving excellent traction, Safe Tread non-slip GRP Decking Strips are a quick and easy solution to improving safety on slippery steps, whilst preserving an aesthetically pleasing appearance. Made from tough, hardwearing, durable GRP, they are guaranteed for 10 years. Tactile range of paving plates with distinctive, raised surface profiles designed to be detectable by both sighted and visually impaired pedestrians. 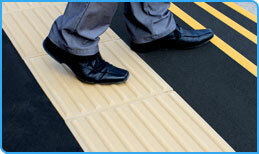 Tactile paving conveys hazard warnings, directional guidance, or the presence of an amenity. 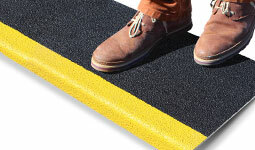 Corduroy, Blister Off-Street, Blister On-Street Paving with a gritted surface giving excellent slip resistance.